Mineral low-viscosity flushing oil for engines and transmissions with a complex of special additives. Contains revitalizant. VERYLUBE flushing oil is designed to clean oil systems of engines and transmissions. Special detergent-dispersant, anti-wear and extreme pressure additives allow safe flushing of the oil system (for 30-40 minutes) and its efficient cleaning from all types of contaminations (up to potential purity). During flushing XADO revitalizant creates a protective reserve against wear. 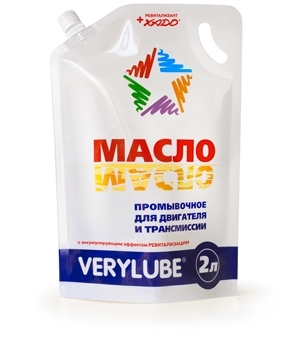 In contrast to other flushing oils, VERYLUBE flushing oil contains a complex of special additives (detergent-dispersant, anti-wear and extreme pressure), it allows safe flushing of the engine oil system up to the potential purity. Anti-wear and extreme pressure additives ensure safe flushing of the lubricating system during prolonged flushing process (up to 30-40 min). Absolutely safe flush of the oil system up to potential purity (VitaFlush Technology). Reserve of wear protection (XADO Technology). Possibility of intensive flushing of strong-contaminated assemblies (up to 30-40 min) with anti-wear additives. Restoration of mobility of oil rings and compression rings. Elimination of the hydraulic compensators lock. Pour in XADO Atomic oil. Pour in XADO Atomic oil for transmissions. Attention! Do not drive with the flushing oil in the system!